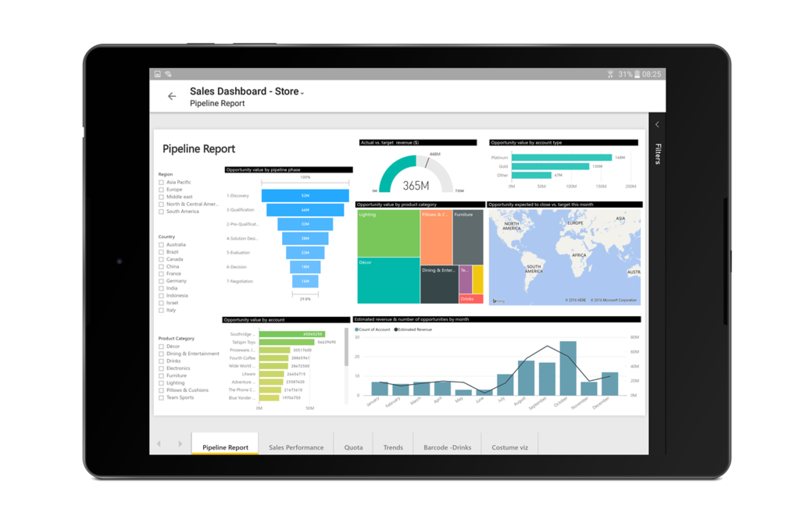 Today we’re introducing the Power BI app for Android tablets. After receiving a lot of great customer feedback and requests, we are excited to bring the powerful Power BI capabilities to Android tablets. With this new app, you can access and interact with all your Power BI and SQL Server 2016 Reporting Services (SSRS) business data, anywhere and anytime. Bringing this app to preview first provides you with an early look at the app, and we’re relying on you to provide critical feedback to shape and improve the app experience. Join the conversation in the Power BI Mobile community forum. The new app for Android tablets combines the familiar look of our Power BI apps with a touch-friendly experience designed for Android tablets. Like our other apps, dashboards and reports render beautifully and you can interact with them using touch. Within the reports, you can slice and dice your data, drill through data hierarchy, and even filter to focus on specific data. Set data-driven alerts to stay on top of your most important metrics directly on your tablet. Data alerts are fully synchronized across all platforms so all your alerts will now be available in your Android tablet. The Android tablet also supports offline capabilities so you can still access your data even when you’re traveling or have limited connectivity. For quicker access to your data, you can flag your favorite dashboards right in the app. Alternatively, use search in the app to access your most recently viewed items and find other dashboards, reports, and groups available to you across the app. You can also scan a QR code with the scanner in Power BI on your tablet to get directly to any dashboard tile or report. Why wait? Download the Power BI mobile app to your Android tablet today! Need help getting started? Check our documentation.